Pronto Pizza was my least favorite of the slices I tried during this trip. 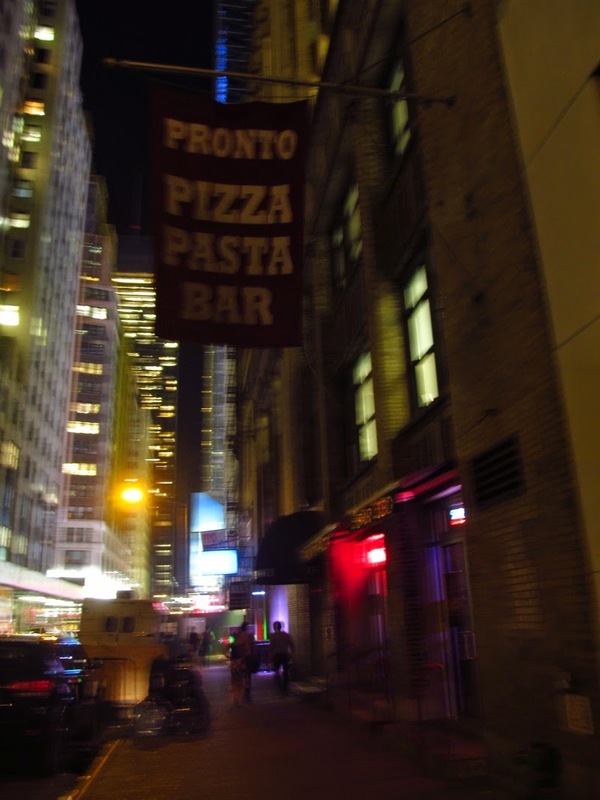 They are located near Bryant Park and may or may not be connected to a larger, nationwide chain also known as Pronto Pizza. I tried a slice of plain cheese and a white slice topped with spinach. Both were very cheese heavy. The crust was somewhat soggy on both slices. The cheese had a weird, cheap tasting flavor to me for some reason. I don't think I'd get pizza here again. Sunnyside Pizza was a much better pizza experience compared to Pronto Pizza. Sunnyside Pizza is located in Queens, directly across from a stop on the 7 train. This tiny restaurant pretty much consisted of their kitchen and a couple tables by the door. I tried a slice of Grandma pizza and cheese. The grandma was different from what I've had elsewhere. I think all other Grandma pizzas I've experienced up until this point have had thin crust. This particular grandma pizza had a thick, Sicilian-like crust. It was topped with a chunky tomato sauce, mozzarella, and basil. The cheese slice was nice and thin. The sauce and cheese both had good flavor with a good ratio to one another. I did enjoy the crust on both slices. Sunnyside Pizza put sesame seeds on the edges of the pie, which I do enjoy. 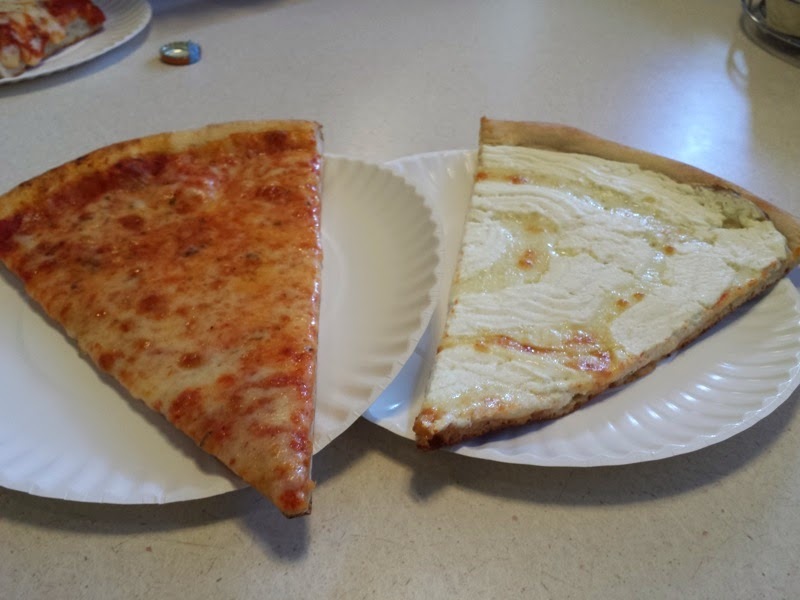 King Umberto in Elmont has been discussed on this blog in the past, but I ended up there again twice during this particular trip to the New York area. I had a stuffed vegetable slice and a fresh mozzarella slice. 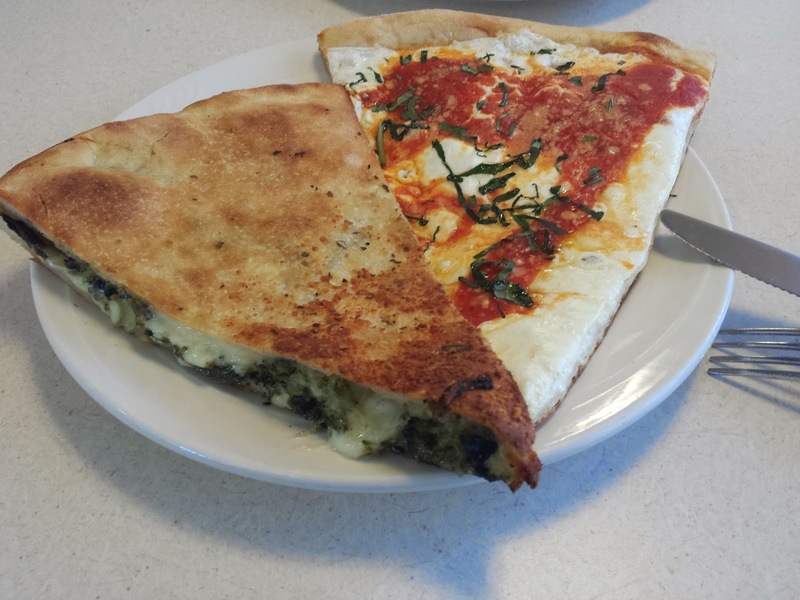 I do enjoy King Umberto's stuffed slice, filled with spinach, broccoli rabe, and cheese. The second visit to King Umberto on this trip consisted of a slice of cheese and white. 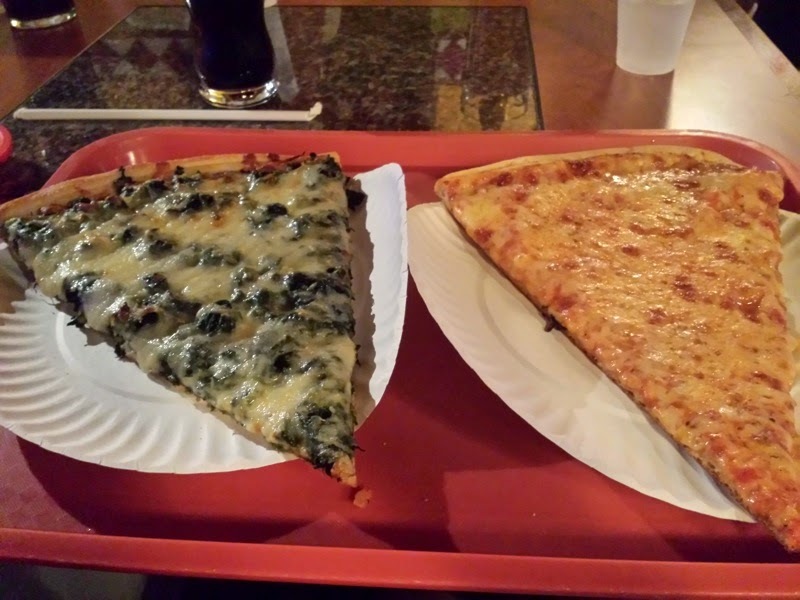 I think I caught Umberto on a bad day because both of these slices were forgettable. A couple days later I ended up at the Hyatt House Hotel a bit upstate in Fishkill, NY. 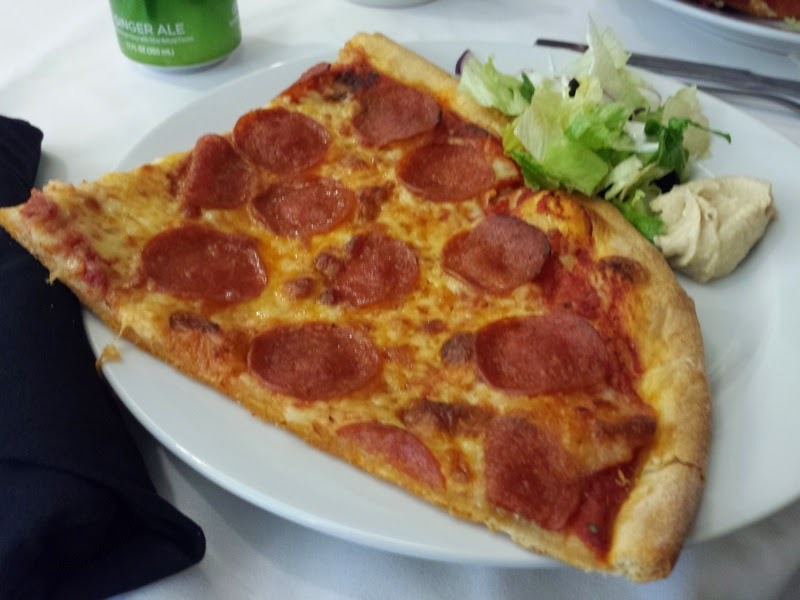 I was attending an event there, and pizza was involved. I don't think the hotel itself made these pizzas and most likely had them delivered. Regardless of where the pizza came from, these pepperoni slices were tasty. I'd rank them above Pronto Pizza. I enjoyed eating far too much pizza during the time I was in New York! I went to the Krispy Kreme Doughnuts in Orlando near Millenia Mall to try their Halloween/Autumn doughnuts. They have all sorts of doughnuts known as Krispy Skremes decorated for Halloween, including Jack-o-Lanterns and spiderwebs. They also have Ghostbusters doughnuts to celebrate the movie's 30th anniversary. I liked their Pumpkin Cheesecake Doughnut. It was stuffed with a pumpkin cheesecake filling, topped with creme cheese icing and gingersnap cookie crumbles. Also pictured is the Pumpkin Spice Doughnut. The Stay Puft Marshmallow Man Doughnut and Ghostbusters Doughnut were also tasted. The Stay Puft Marshmallow Doughnut was a marshmallow Kreme-filled shell topped with white icing, decorated with Stay Puft Marshmallow Man’s familiar face and a sugar piece hat. The Ghostbusters Doughnut consisted of a marshmallow Kreme-filled shell topped with white icing, a decorative green “splat” inspired by Slimer, and a Ghostbusters logo sugar piece. They had a doughnut decorating station set up and I created this Ghostbusters Doughnut. Should I be proud of my slime placement on this doughnut? Now for the important part! Everyone likes free food. Make sure you wear a costume to Krispy Kreme on Halloween. It will get you a free doughnut! 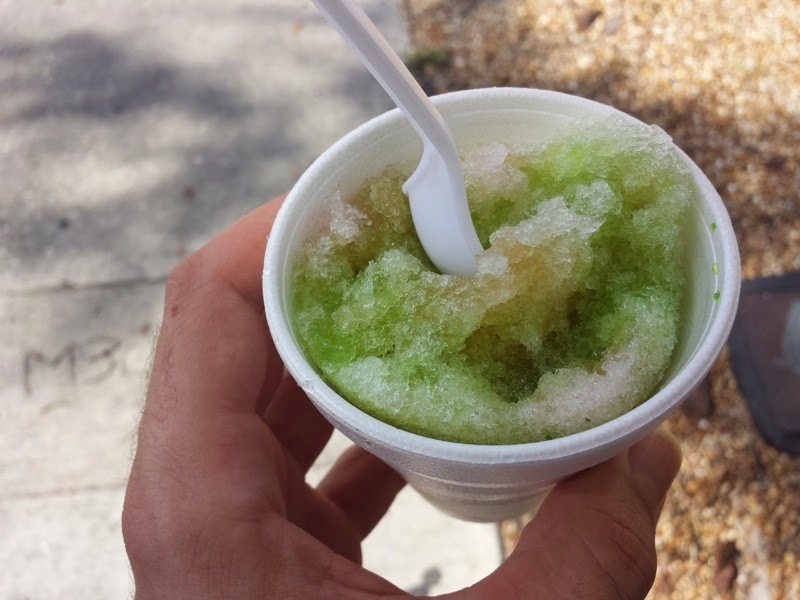 I was in Downtown Deland and got dessert from a shop called Snow Buckets. They specialized in snow cones and are located in the space once occupied by an ice cream shop called Cone Heads. I really didn't know what to expect from Snow Buckets' snow cones. Would they be the lower end snow cones consisting of chopped ice and syrup? Would they be the delicate, finely shaved ice found in Hawaiian shaved ice? Asian style shaved ice topped with fruit and condensed milk was also a potential option here. Curiosity of what sort icy dessert was served was my main reason for stopping here. It turned out Snow Buckets served the classic snow cone. First they coarsely chopped ice into a cup. Syrups were then selected. I chose passion fruit and guyabana. I was sort of expecting them to pour one syrup over half the cup and the other over the other half, but the two syrups mixed right on top of each other. This created in interesting flavor combination that tasted like neither passion fruit or guyabana. I had lunch at Carmel Cafe in Altamonte. Carmel is a chain with several restaurants throughout Florida. They have had locations in the Orlando area for a while now, but this was my first experience with them. This location took over a space formerly occupied by a Friendly's. Carmel put much effort into leaving no trace of which restaurant this building once housed. When you are seated in the restaurant, they bring an iPad to your table which stays there during the duration of your meal. You can use the iPad to see photos of all the menu items. If you're afraid of social interactions with real life humans, you can also order your food on the iPad to avoid talking to your server if you wish. I can't say I'm a big fan of restaurants that push electronics at your table. Much like Chili's and certain Outback Steakhouses, these get annoying. They flash advertisements at you while you're eating and minimize the need for actual servers. I ordered one of Carmel's Lunch Combos which came with a flatbread and a salad. I tried the Black Olive Caesar as the salad. 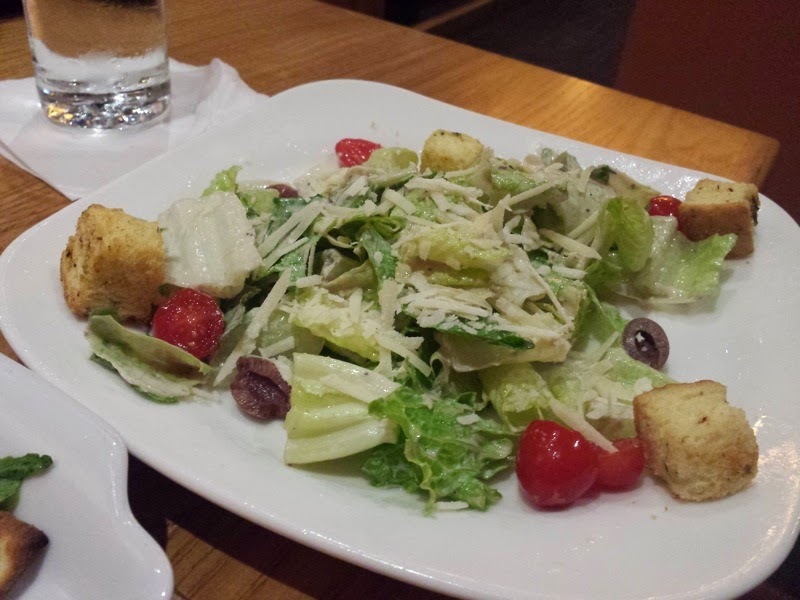 This was a typical caesar salad, topped with olives and tomatoes. I picked the Grilled Lemon Chicken and Artichoke Flatbread. Parmesan and arugula also topped the pizza. The chicken had a nice, strong lemon flavor. The artichokes were few and far between. 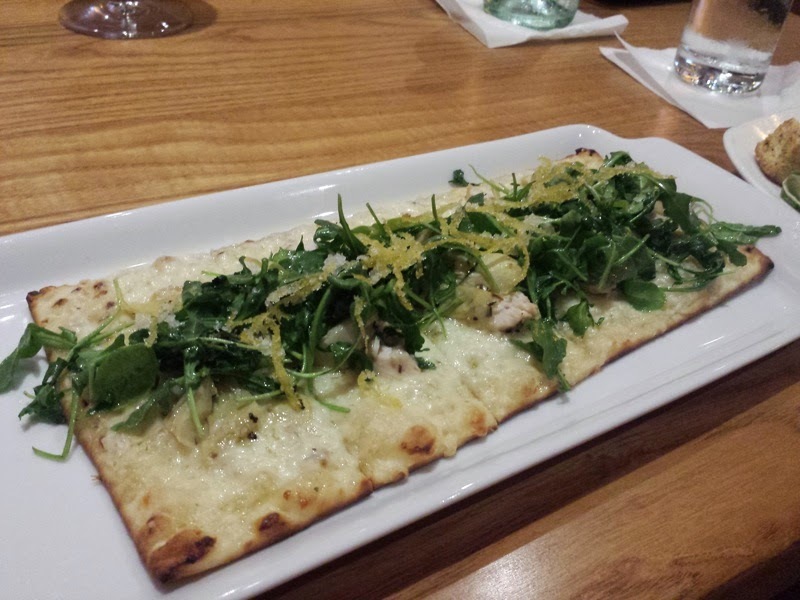 I did enjoy the warm arugula over the flatbread. It gave the pizza a bit more character. I was also getting hints of cinnamon with certain bites. I was not expecting this, but I did enjoy the random bursts of flavor. Carmel Cafe was an okay eating experience. Not the best, not the worst. I'd be willing to give them another try eventually.